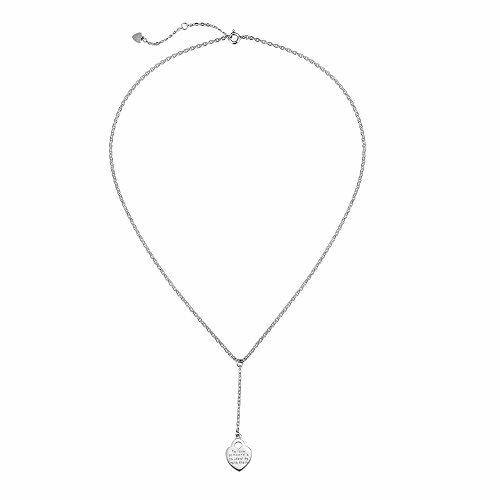 Add this very trendy lariat love necklace to your love collection. The tiny heart design carries a message of love, a great gift for your loved ones in this holiday season. Quality - 925 sterling silver base, rhodium plated, highly polished. Nickel and lead free; Hypoallergenic guaranteed. Size - Chain is about 1mm wide, 15.5 inch long with a 1.5 inch extender to fit most necklines. Satisfaction - 30 day money back guarantee. Gift - Packed in our brand jewelry box, ready for gifting. If you have any questions about this product by Lemon Grass, contact us by completing and submitting the form below. If you are looking for a specif part number, please include it with your message. Shaoan Jewelry Graduation Gift Sterling Silver Long Tassel Necklace Bar Y Lariat Long Chain Drop Adjustable Necklace Gift for Her, 30"